The teams, including Kiwi FC, Central United, Faatoia United FC, Vaitele-Uta, Lupe o le Soaga, Moaula, Adidas SC, Vaimoso SC and Unity FC, attended the presentation ceremony with club management and were selected to receive this gear based on their participation last season. FIFA’s support programme assists with launching, developing and strengthening women’s football competitions and leagues in order to give females a pathway to follow in football. Last year, F.F.S applied for the same assistance to put towards the girls youth league. Special guest Anter Isaac, a FIFA performance consultant from Australia, presented the equipment to representatives from the women’s teams and was taken aback by the amount of supplies provided by FIFA’s support programme. “I didn’t realise how much there was but I think this is a very good indication of how important FIFA values the Federation and the effort that everyone involved in football in Samoa is putting in”, he said. The teams were supplied with Adidas branded uniforms and equipment to be used for training sessions or official matches. 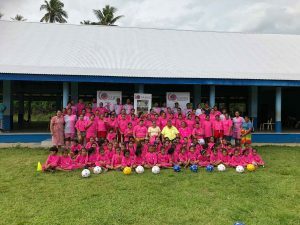 FIFA and OFC have placed a great emphasis on the development of women’s football and Football Federation Samoa has recently established initiatives such as a local Women’s Football Development Committee and a four year development plan to push women’s football to greater heights within Samoa. Chairwoman of the Women’s Football Development Committee Emily Young spoke about the Committee’s objectives. “We will continue to actively look into ways to promote women’s football and provide financial support to implement workshops, programs, courses and training sessions”, she said. 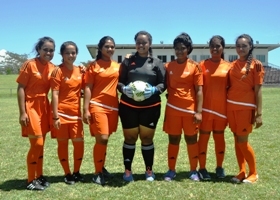 The Women’s Football Development Committee also consists of Lynette Faaiuaso, Theresa Asiata, Letti Tamasese and Tala Tevita Ripley. The senior women’s teams are now preparing for the 2014-15 season which kicks off on Saturday 1st November, 2014 at the F.F.S football fields in Tuanaimato.